It’s one of the fastest growing mortgage markets in America – are you getting your share? With approximately 10,000 Americans becoming eligible every day, the reverse market is this decade’s biggest opportunity – and you could be missing out. Today’s homebuyers say they want move-in ready homes, but they are also drawn to the bargain pricing of distressed properties in great locations. 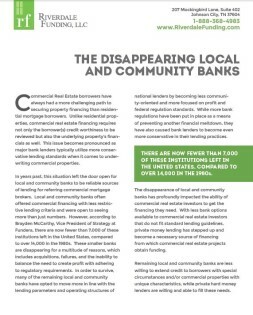 Knowing what to look for in a lender is crucial for any broker who wants to take advantage of the growing opportunities in America’s commercial real estate industry. More investors than ever are looking for brokers who can help them secure financing, but many struggle simply because they’re not partnering with the right lender at the right time. If you want to get informed, download this comprehensive white-paper today.